Hey! Congrats on finishing your first feature spec. That’s awesome! You’re already light years ahead of all those folks who call themselves screenwriters, talk about all their ideas, write first act after first act, but never actually finish a project. Here’s the thing, though. First scripts are usually no good. I know, I know. I didn’t read your masterpiece, I don’t know you. But I can assure you, whatever you write next is going to be better. You may have mastered screenwriting in theory. Read all the books, chatted on the message boards. 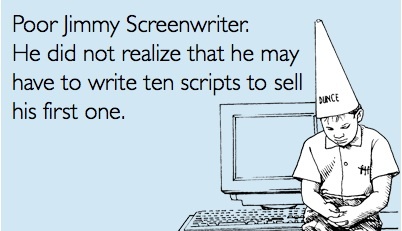 But when it comes to writing a good screenplay, it almost never happens on the first try. So, you finished! Awesome. Now you know you can do it. You are a writer. You are capable of finishing projects, with (hopefully) the final product being something you’re proud of. Now write the next one. You now know it’s not that hard! Well, it’s not that hard for you, because you’re great. So shelve that first screenplay, and write your second one. Then your third. Now, you have three screenplays under your belt. You’re learning intangible things about writing and structure that you may have known in theory, but now have in your subconscious. Eventually, you’ll have it in your DNA. You’ll sleep type 110 pages that hit all your key points. So, go ahead. Write your two next screenplays. Then continue reading this comment. Now that you’re even more awesome at screenwriting (which is pretty awesome, considering how wonderful you were before, you feature-finisher, you! ), why don’t you take a look at that first feature? That one you were so proud of! Oh, man. Sure, it’s got some great moments, and a killer concept, but now you’re noticing all the little things. Oh, wow, nothing moved the plot forward for 10 lines in this scene. Or, hey, these two characters serve the same purpose, do I need them both? Now you have a better eye for what makes a screenplay quality, but also economical, and unique. So now, fix up your first script. Fix up your second. Hell, give your third a polish while you’re at it. Now you’ll have three scripts you’re proud of.